With this article, we, OpenDataScience, launch an open Machine Learning course. This is not aimed at developing another comprehensive introductory course on machine learning or data analysis (so this is not a substitute for fundamental education or online/offline courses/specializations and books). The purpose of this series of articles is to quickly refresh your knowledge and help you find topics for further advancement. Our approach is similar to that of the authors of Deep Learning book, which starts off with a review of mathematics and basics of machine learning — short, concise, and with many references to other resources. The course is designed to perfectly balance theory and practice; therefore, each topic is followed by an assignment with a deadline in a week. You can also take part in several Kaggle Inclass competitions held during the course. 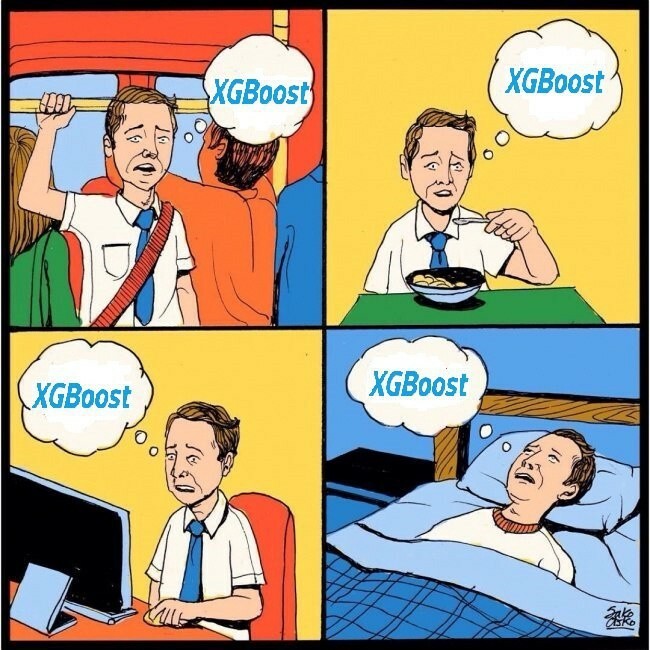 All materials are available as a Kaggle Dataset and in a GitHub repo. The course is going to be actively discussed in the OpenDataScience Slack team. Please fill in this form to be invited. The next session of the course will start on October 1, 2018. Invitations will be sent in September. One of the most vivid advantages of our course is active community. If you join the OpenDataScience Slack team, you’ll find the authors of articles and assignments right there in the same channel (#eng_mlcourse_open) eager to help you. This can help very much when you make your first steps in any discipline. Fill in this form to be invited. The form will ask you several questions about your background and skills, including a few easy math questions. We chat informally, like humor and emoji. Not every MOOC can boast to have such an alive community. 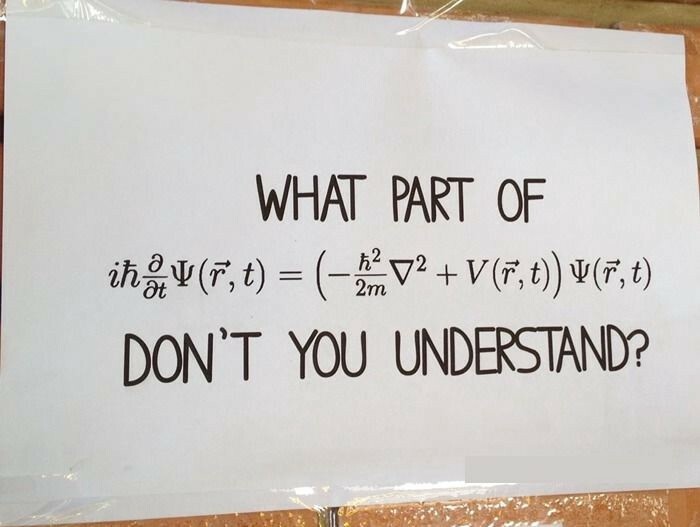 The prerequisites are the following: basic concepts from calculus, linear algebra, probability theory and statistics, and Python programming skills. If you need to catch up, a good resource will be Part I from the “Deep Learning” book and various math and Python online courses (for Python, CodeAcademy will do). More info is available on the corresponding Wiki page. As for now, you’ll only need Anaconda (built with Python 3.6) to reproduce the code in the course. Later in the course you’ll have to install other libraries like Xgboost and Vowpal Wabbit. You can also resort to the Docker container with all necessary software already installed. More info is available on the corresponding Wiki page. The solutions to assignments will be sent to those who have submitted the corresponding Google form. Well... 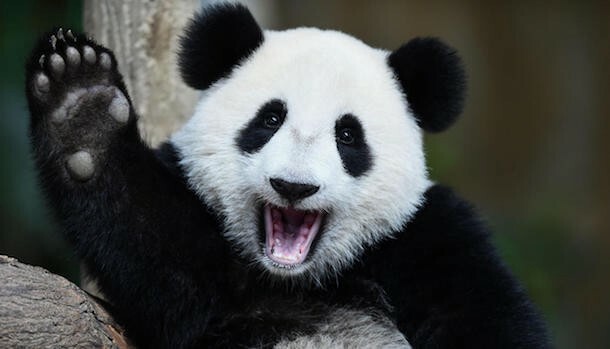 There are dozens of cool tutorials on Pandas and visual data analysis. If you are familiar with these topics, just wait for the 3rd article in the series, where we get into machine learning. The following material is better viewed as a Jupyter notebook and can be reproduced locally with Jupyter if you clone the course repository. The main data structures in Pandas are implemented with Series and DataFrame classes. The former is a one-dimensional indexed array of some fixed data type. The latter is a two-dimensional data structure - a table - where each column contains data of the same type. You can see it as a dictionary of Seriesinstances. 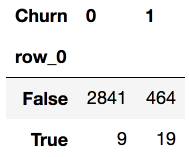 DataFrames are great for representing real data: rows correspond to instances (objects, observations, etc. ), and columns correspond to features for each of the instances. Recall that each row corresponds to one client, the object of our research, and columns are features of the object. Let’s have a look at data dimensionality, features names, and feature types. DataFrame can be indexed in different ways. 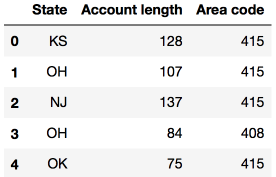 What are average values of numerical variables for churned users? How much time (on average) do churned users spend on phone during daytime? In the first case, we would say “give us the values of the rows with index from 0 to 5 (inclusive) and columns labeled from State to Area code (inclusive)”, and, in the second case, we would say “give us the values of the first five rows in the first three columns (as in typical Python slice: the maximal value is not included)”. If we need the first or last line of the data frame, we use the df[:1] or df[-1:] syntax. aggfunc — what statistics we need to calculate for groups - e.g sum, mean, maximum, minimum or something else. 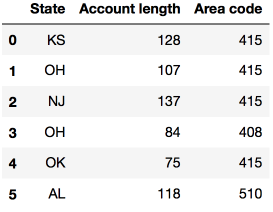 Like many other things in Pandas, adding columns to a DataFrame is doable in several ways. 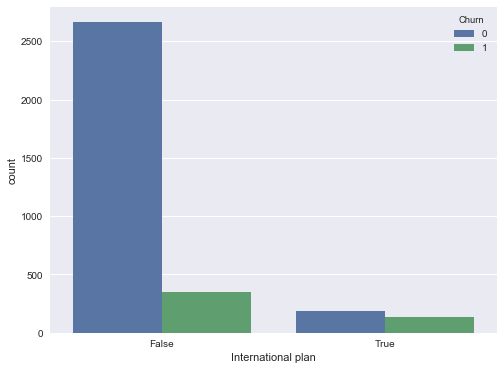 Let’s see how churn rate is related to the International plan variable. We’ll do this using a crosstab contingency table and also through visual analysis with Seaborn (however, visual analysis will be covered more thoroughly in the next article). We see that, with International Plan, the churn rate is much higher, which is an interesting observation! Perhaps large and poorly controlled expenses with international calls are very conflict-prone and lead to dissatisfaction among the telecom operator’s customers. Next, let’s look at another important feature — Customer service calls. Let’s also make a summary table and a picture. 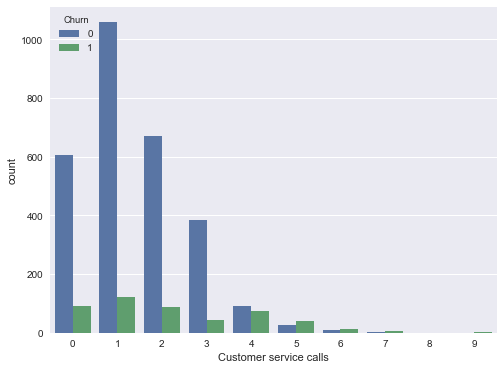 Perhaps, it is not so obvious from the summary table, but the picture clearly states that the churn rate strongly increases starting from 4 calls to the service center. 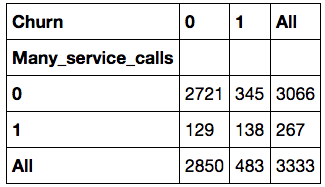 Let’s now add a binary attribute to our DataFrame — Customer service calls > 3. And once again, let's see how it relates to the churn. Therefore, predicting that a customer will churn (Churn=1) in the case when the number of calls to the service center is greater than 3 and the International Plan is added (and predicting Churn=0 otherwise), we might expect an accuracy of 85.8% (we are mistaken only 464 + 9 times). This number, 85.8%, that we got with very simple reasoning serves as a good starting point (baseline) for the further machine learning models that we will build. Full versions of assignments are announced each week in a new run of the course (October 1, 2018). Meanwhile, you can practice with a demo version: Kaggle Kernel, nbviewer. Authors: Yury Kashnitskiy, and Katya Demidova. Translated and edited by Yuanyuan Pao, Christina Butsko, Anastasia Manokhina, Egor Polusmak, Sergey Isaev, and Artem Trunov. A series of articles on basics of Machine Learning. Each article is followed by an assignment with a deadline. Several Kaggle Inclass competitions are held throughout the course.